The difficulty in acquiring knowledge or an understanding about the life or times of St. Niketas, stems in part from the turbulent era into which he was born in. A period which historians sometimes term the Dark Ages due to the lack of extensive or surviving written documentation which could help us better understand the era. The difficulty is magnified by the fact that the era was a time of socio-political and economic upheaval and change, characterised by mass-migrations of people. St. Niketas’ own people, the Goths, belonged to these complex set of events to which archaeologists are trying to piece together. What we know of St. Niketas’ people the Goths, is that they were a Germanic people who due to population pressures and wars, left their own homeland and had settled in the 3rd century around the lower Danube river basin and began settling in areas north of the Black Sea. 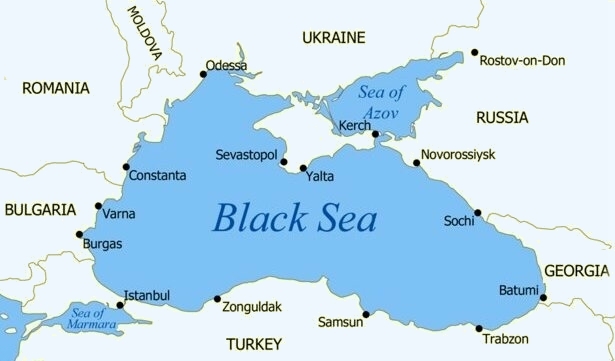 The 6th century Gothic historian Jordanes, cited that the Goths originally came from what we now know as southern Sweden, from there they came across the Baltic Sea entering the basin of the Wisla (Vistula) River, and over time reached their Danubian location. 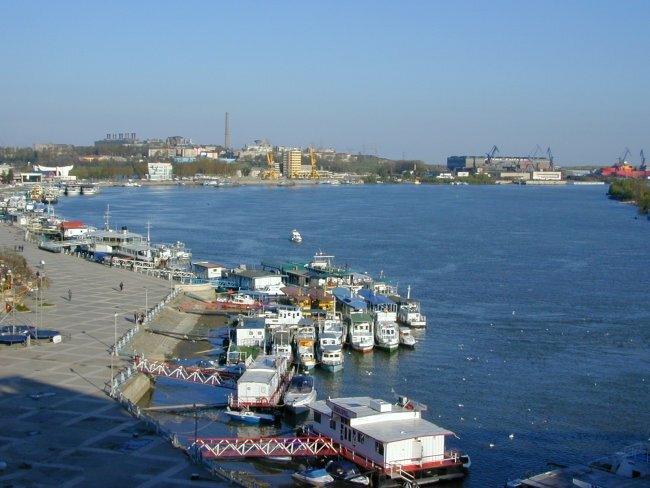 After many years of war and sending out raiding parties, they settled in parts of Romania, Hungary, Moldavia and the Ukraine north of the Danube river and as far east as the Dnestr River. 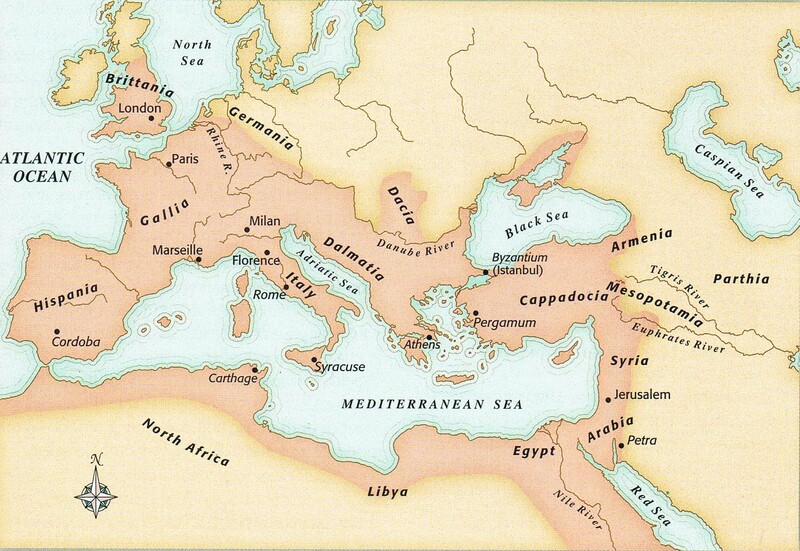 With the exception of the great 4th century leader Ermanaric, who had united the Goths into a single political entity, the Goths remained as a collection of kingdoms and fiefdoms often warring against each other and with outsiders. 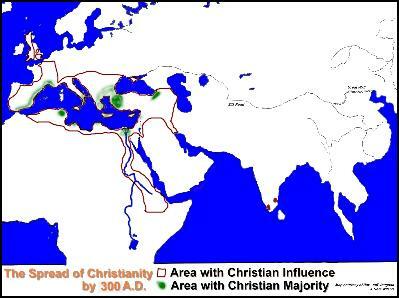 Nevertheless, by virtue of geography and trade, the Goths were to become the first Germans to become Christianised. Greek missionaries and merchants often travelled through Gothic territory preaching the Christian message, while Gothic merchants, military men and nobility sent their sons southwards to receive an education. 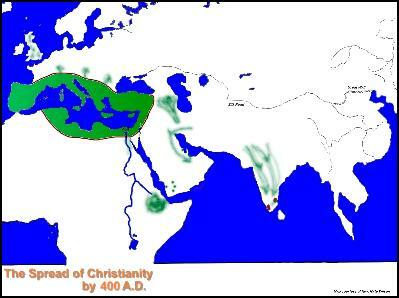 Thus in this manner, the Goths acquired both Christianity and the advances of settled civilisation. 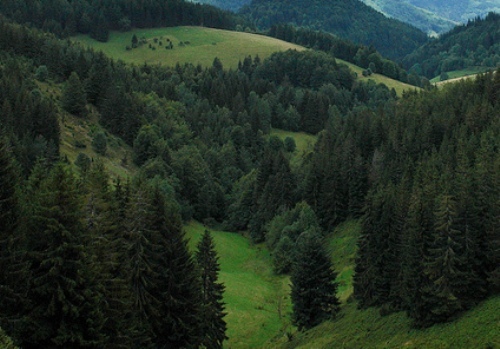 It was within this environment that St. Niketas was born into, but many years after his martyrdom, the Goths due to wars and invasions were uprooted from these lands and migrated to Italy, southern France and Spain whereby they then disappear from the pages of history, probably due to assimilation with the native inhabitants. The reason why we cite this brief history, is because it is possible that St. Niketas may be amongst the first, or earliest, documented German saints of undivided Christendom. Only time and research will reveal whether this is the case, but it may be a distinguished honour for our noble champion of the Faith. 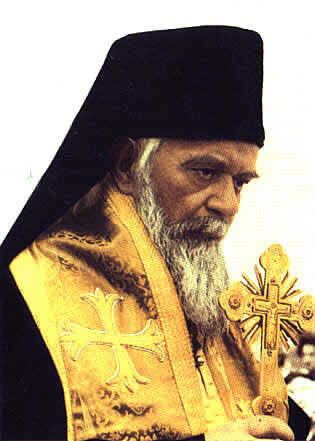 Blessed Saint Niketas intercede for us with your prayers. What we know personally about the heroic Martyr Niketas the Goth, is regretfully minimal. 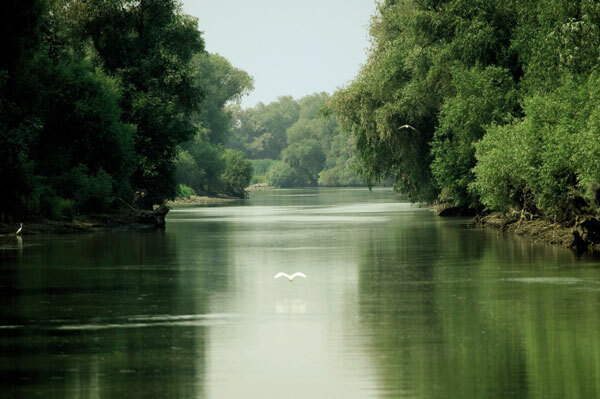 However what we can say with some certainty is that he was a soldier who was born during the reign of Constantine the Great, in the region near the Danube’s delta to devout Christian parents. He was illumined and baptised by Bishop Theophilus, who was the well-known enlightener of the Goths, and had been a strongly vocal participant, upholding the Orthodox view within the First Ecumenical Council at Nicaea (325 AD). Due to this personal formation in the Faith, under the mentoring of Theophilus, Niketas was not an Arian as some have asserted. The error stems from the fact that Urphilus (Ulfilas, 311-383AD) succeeded Theophilus as bishop and helped continue Niketas’ theological studies, but his task was instruction within the Scriptures and Greek, not within matters of dogmatics. Nonetheless from existing evidence, Urphilus was still adhering to the Orthodox Faith when Niketas was undergoing his time of spiritual formation. Nevertheless diligent care was shown towards Niketas in the hope that he would serve as a faithful translator and educator. Thus continuing the work Urphilus had undertaken, since the bishop had devised an alphabet for the Goths and had begun translating religious and non-religious works from Greek into Gothic German. In time Urphilus placed Niketas within the role he had set for him, as well as designate Niketas as a teacher of the Faith, to evangelise the Goths. However at that time, intense warfare arose amongst the Goths who were divided into two separate groups. At the head of one hostile side stood Prince Athanaric (Athanarichus), who was a vehement pagan and a hater of Christians, while Phritigern (Frigentus) who was a Christian, led the opposing camp. The two leaders met in battle and in the ensuing bloody clash of armies, Athanaric was victorious. As a consequence Phritigern and his followers were forced to flee to Constantinople. Nonetheless within a short time Phritigern returned to his homeland, reinforced with fresh troops afforded him by Emperor Valens (364-378AD). 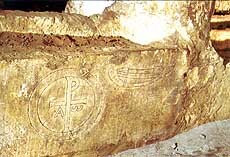 Prior to confronting Athanaric in battle, Phritigern commanded that the image of the Holy Cross be made on the standards of his army, as once did Emperor Constantine the Great. A second bloody battle took place, and this time Phritigern was victorious, but Athanaric, with a small group of adherents, was saved by fleeing the scene. After Phritigern’s astounding victory, favourable times ensued for Christianity, whereby Urphilus and Niketas were able to continue their endeavours for the education and enlightenment of the Goths. 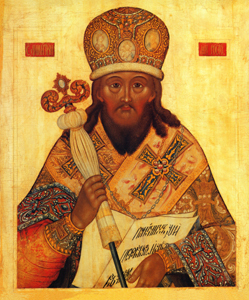 Through his preaching and pious way of life, Niketas greatly assisted the confirmation of the Christian Faith amongst the Goths and helped to illumine many. 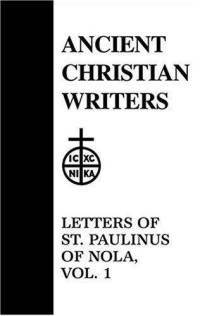 From the writings of his close friend St. Paulinus of Nola, we know that St. Niketas became Bishop of Remesiana in Dacia (parts of modern Romania and Yugoslavia), and was noted for his successful missionary activities, particularly amongst the maraudering race of Bessi, which Paulinus commemorates in a poem. True to the call of his ministry, Niketas wrote several dissertations on Faith, the Creed, the Trinity, liturgical singing, and is believed by some scholars that he may be the author of Te Deum (“Thee, O God, we praise”). The other personal detail we know of Niketas’ time within the episcopacy is that on at least two occasions, he made his way from Dacia to Nola in Campania (Italy) to visit his friend Paulinus. We also know that St. Jerome knew of Niketas and spoke highly of him, particularly his missionary work amongst the people of Dacia. Unfortunately after a few years had passed, Athanaric returned to his homeland with an immense army to break peace and stability, and once again feed the flames of hostility, bloodshed and merciless warfare amongst the Goths. Once again Athanaric overcame Phritigern, and then let loose the wrath of a very cruel and sadistic persecution against the Christians. Niketas, who was a respected military veteran and as spiritual leader of the Christian Goths, denounced Athanaric for his cruelty and godlessness. He exhorted the faithful to remain steadfast in the face of such tyranny and to not fear the possibility of martyrdom. Naturally it was a matter of time before Niketas was seized and handed over for heinous tortures. 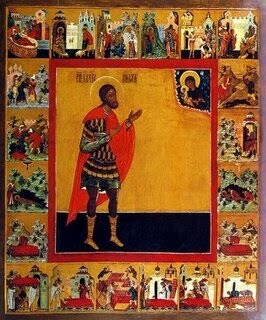 Every effort and attempt was made to force Niketas to renounce his Faith and deny Christ publicly. This only had the effect of causing Niketas to proclaim even more strongly his faith and love for the Saviour. 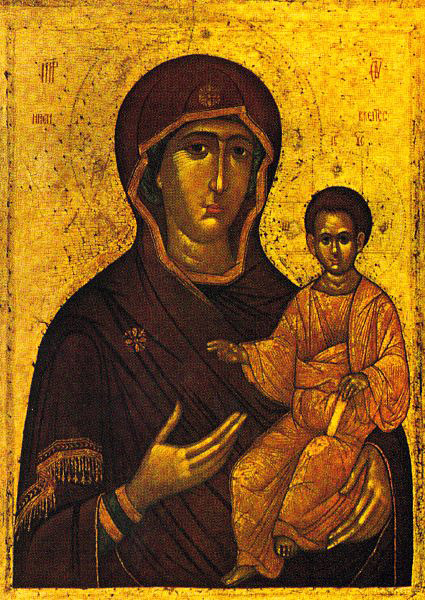 Nevertheless through this period of testing his mind was unceasingly raised up to God, and on his breast under his robe he bore an icon of the all pure Theotokos with the Pre-eternal Christ Child standing and holding the Cross in His hands. It is said that St. Niketas kept this icon because the Holy Theotokos had appeared to him and brought him comfort in times of trial. Realising that they could not break Niketas or his faith, his torturers decided that it would be far more expedient to make an example of him by burning him alive. 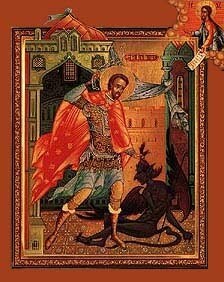 Thus on September 15, 372AD the Great Hieromartyr Niketas was cast into the earthly fire where he gave up his soul, acquiring the heavenly crown of victory. Yet his body remained unharmed by the fire and was illumined by a miraculous light. 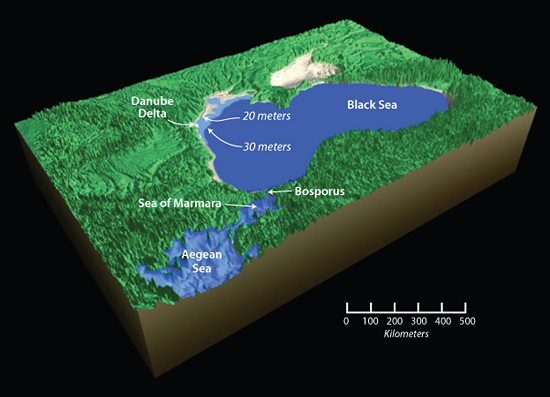 Some years later a close friend of the martyr, a Christian named Marianus, at night retrieved St Niketas’ body from where he had been buried in the land of the Goths (Wallachia and Bessarabia), whereby Marianus took the Saint’s remains to the town of Mopsuestia where he buried it. 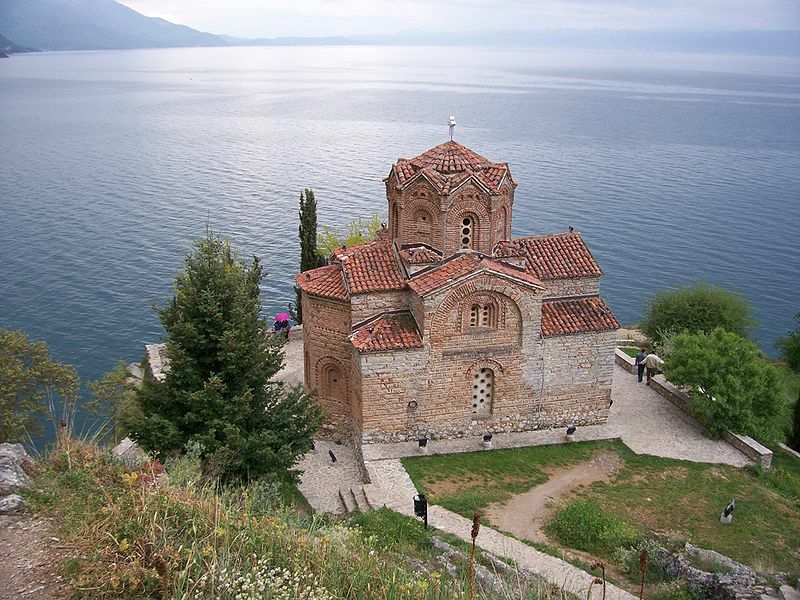 In time St. Niketas’ remains were transferred to Constantinople for safekeeping. 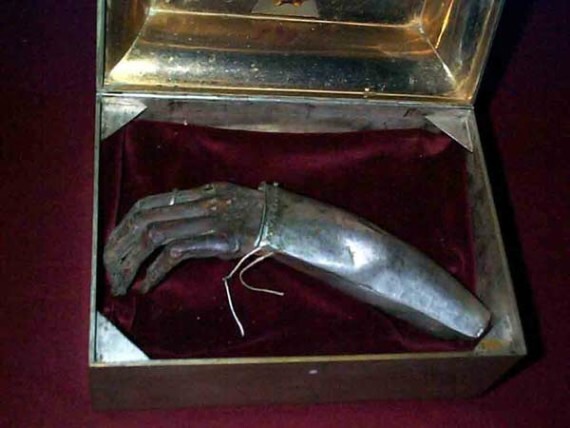 Though, part of the relics of the Great Martyr was later transferred to the Monastery of Vysokie Dechani in Serbia where his incorrupt hand works many miracles right down to our own time. 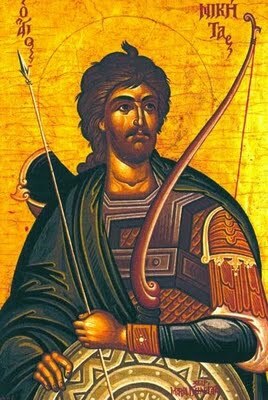 Destroying the might of error by your firm resolve, and taking the crown of victory through your suffering, O Niketas, namesake of victory, you rejoice with the angels, and with them, O glorious one, you ceaselessly pray to Christ God for us all. What others have said concerning St Niketas throughout the ages. 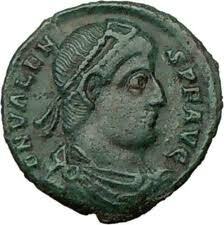 Urphilus was a native of Cappadocia (central Turkey), who had been captured by Goths on a raid. He had been sent as part of an embassy entourage to Constantinople, when Eusebius of Nicomedia consecrated him as bishop of the Goths (341AD). Apart from his translation works, particularly the Scriptures, he had worked hard for the conversion of the Germanic peoples. However he belonged to the “Homoiousian” party of moderate Arians, and thus bears some of the responsibility for the converted Goths who had sided with the heretics. thank you very much for this web contribution about St. Nicetas.